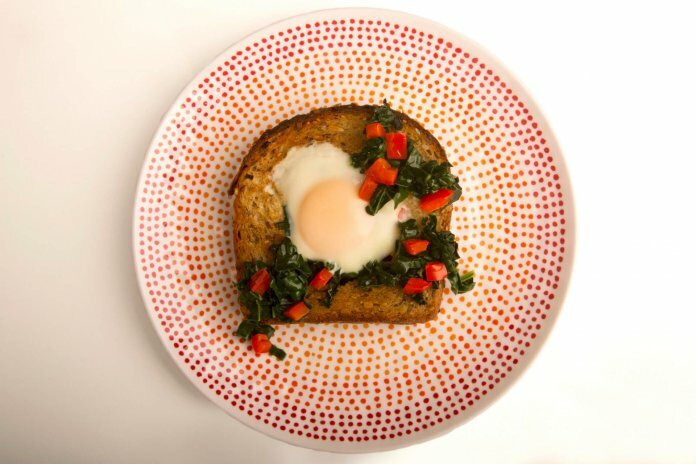 Eggs Croque Madame with kale is a perfect breakfast with an egg in a hole in one quite literally! It combines healthy wholesome multigrain bread and delicious, nutritious kale with one of the most complete foods on the planet, eggs.It’s a hearty, easy way to start the day and is a real crowd pleaser. It tastes delicious and looks amazing. 1. In a small sauté pan heat oil. Add shallot and red pepper to the pan. Cook until soft, about 2 minutes then add kale. Cook for another minute until the kale is wilted. Remove from pan and set aside. 2. Heat a small non-stick pan and spray with cooking spray. Place slice of bread in the middle of the pan. Place ¼ cup of the vegetables in the hole and arrange them so they come up the sides and are in an even layer on the bottom. Place egg over top of the vegetables. Cook until the egg is set and flip or cover with a lid and cook sunny side up. Season with salt and pepper and serve. If cooking sunny side up, toast the top side of the bread beforehand. I keep butter wrappers in my freezer to use instead of spray to lightly oil my pans.